Status: Restoration completed April 2011. Sold. The Wm. Knabe & Co. was one of America's best known and highest quality piano companies, established in 1839 by William Knabe and Henry Gaehle in Baltimore, Maryland. By the 1850's, Knabe took control over from Gaehle, and he and his sons managed it until nearly the end of the 19th century, when the company incorporated and eventually joined the American Piano Company (Ampico) in 1908. 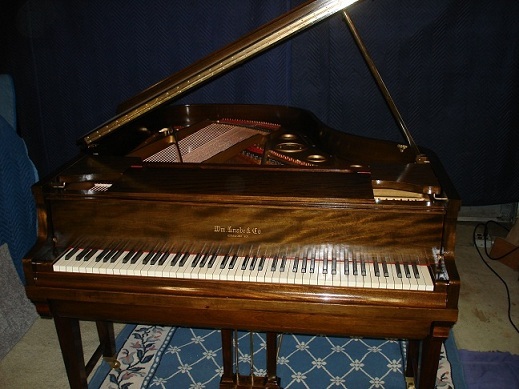 Knabe and eventually Mason & Hamlin were the highest-quality instruments that installed Ampico reproducing player systems during the heyday of the player and reproducing piano from about 1910 to 1933. Knabe was known especially for its excellent scale designs, which among other innovations featured grand pianos with a wider, more square-shaped tail that allowed for a longer bass bridge with wider-spaced strings, with an overall larger soundboard area than in typical designs of the same length. The bass bridge was also positioned on a more resonant section of the soundboard further from the rigid rim of the piano, reportedly allowing for much stronger bass tones than on narrow-tail designs of similar length. Knabe instruments from the late 19th century until about 1930 are often the most prized. Like many American piano companies, Knabe's brand reputation for quality suffered somewhat during the mergers and collapse of the piano industry during the depression and with competition from radio and electronic recording. The focus of the American pianos market during the 1940's through the 1960's on very small, inexpensive uprights and spinets also did not help many brand reputations for quality. Later Knabes were built at the Aeolian-American factory in Rochester NY. The rights to the Knabe name have since changed hands several times, and new Knabes are currently manufactured by Samick Music Corporation of Korea. This 5'4" Knabe baby grand is serial # 100306, manufactured in 1926 in the original Knabe Baltimore factory. It came to Historic Pianos intact with its original Ampico player action, but entirely unplayable due to 85 years of deterioration of the action, pinblock, and player components. When new, it was purchased together with an identical instrument by two young musically-inclined brothers, and the pianos remained in their families in Zanesville, Ohio until this one came to Historic pianos in late 2009. In particular, the pinblock had badly cracked and delaminated, so that the piano could not be tuned properly. There was little or no damage to the casework, but the wood finish had crazed (or "alligatored") and darkened, entirely obscuring the grain of the original brown mahogany veneers. This Knabe has the wide, square tail design for which the brand was noted. The restoration of the instrument began in late 2010 when commissioned by a customer who wanted a high quality vintage reproducing player grand for a location where only a small baby grand would fit. The wider and longer 5'8" Knabe design was somewhat too large for a comfortable fit, along with most Duo-Art designs with the spoolbox above the keys adding to the instrument footprint. The drawer-mount Ampico design in the smaller baby grand was ideal for the location. Restoration was completed in the spring of 2011, and the instrument was delivered to the customer, who was very pleased with the appearance and the sound. The complete restoration included fitting a new maple pinblock, regilding the stringplate, complete soundboard and bridge repair, restringing with new steel treble strings and custom bass strings, new #2 tuning pins, repair and replacement of damaged ivories, and complete action repair and regulation, including new hammers and damper felts. The mahogany case was refinished in original French polish lacquer using traditional shellac / oil / pumice techniques to achieve a smooth, closed-pore finish. The restringing was carefully designed for even tone production over the full scale, with detailed scale analysis and measurement of each string length and weight in the original manufacture. The new hammers were custom tapered and shaped, and individual hammer and key lever masses were carefully adjusted for uniform playing response of each note. The player action was also completely restored with all new pneumatic cloth, leather nuts, tubing, etc. And the restored player was extensively tested during rebuilding and reinstallation so that each component (pump, expression controls, stack, motor, etc.,) was properly airtight and performed to like-new specifications. And the installed player action was fully adjusted so that it plays Ampico-coded rolls just as they were intended to be performed. Posted videos of the instrument demonstrate both the sound of the piano and the fidelity of the pneumatic Ampico performance reproduction. The responsiveness and power of a pneumatic reproducing player such as this one significantly exceeds the capabilities of new electronic solenoid-activated player systems. Both the Ampico and Duo-Art reproducing systems were capable of wonderful recording quality, but this instrument does a remarkable job of justifying the Ampico tagline, "Reenacting the Artist."